Barring a few, most political parties gave the very first meeting convened to brief them about the guidelines of the model code of conduct by the District Election Officer, Rahul Tewari, a miss at Bachat Bhawan here today. 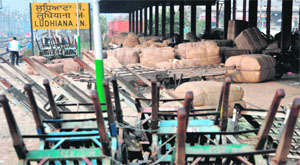 The election code of conduct due to the upcoming state Assembly elections is weighing heavy on the trade and industry. Unable to carry cash in hand, businessmen are left with no option but to directly deposit the salary of their workers in their bank accounts. The “Jaggi-Jeeta” cartoon characters of the Punjab Pradesh Congress Committee that were removed following the imposition of the model code of conduct in the state will once again dot roads from today onwards. It is learnt that after taking permission from the Congress high command, the company managing advertisement campaigns for the Congress has again taken several unipoles on rent where these advertisements would be put up. The agency engaged by the construction wing of Northern Railway today commenced the piling work (for the construction of foundations and erection of two supporting pillars) at the under-construction railway overbridge (ROB) in place of the Lakkar Pul here. 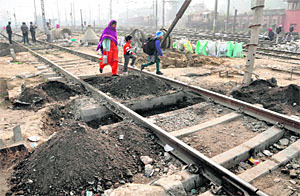 Experts and technical staff of the railways are closely supervising the work. With the special train for ferrying hosiery consignments failing to kick-start, local trader have been forced to deliver their orders late or dispatch these through road. Established in 1962, Punjab Agricultural University is all celebrating its Golden Jubilee in 2012. The celebrations formally began on the campus in the presence of several former vice-chancellors of the university. Those attached with the farm varsity for several decades felt the PAU had made the food-deficit country a food-secured nation. It was due to the untiring efforts of the PAU scientists and farmers attached with it that Punjab was pooling in maximum in the food kitty of nation. Even as the first list of candidates for the Assembly elections is expected to be announced later this evening by the Congress high command, the clouds of rebellion are already casting their shadow on the electoral prospects of the official nominees. The gender divide in the city is all too palpable when it comes to politics. Unlike boys, girls exhibit a disinterest in politics. Politics is not the issue of debate around girls’ tea tables in colleges canteens. They are more concerned about fashion and glamour. Whereas, boys’ tables are divided on the basis of political beliefs. “Teaching is not just about covering the syllabus but uncovering the contents too. Effective teaching involves emphasis on better reading amalgamated with research work,” said Dr Parm Pal Singh, principal, Ludhiana Group of Colleges (LGC), at Chaukimann on the Ferozepur Road. 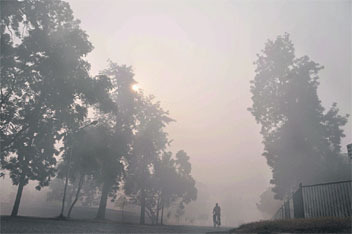 The Knitwear Club and the Chamber of Industrial and Commercial Undertaking have in a communiqué to the Election Commission expressed anguish with an ordinance passed by it, which makes it mandatory for a person to submit the ID proof along with the details of cash to the Income-Tax department for carrying Rs 2.5 lakh. The Punjab government did its best to pacify a few teacher unions by approving most of their demand just before the Assembly elections. But, it seems the imposition model code of conduct has spoilt the SAD-BJP plans for strengthening their vote bank, as majority of teachers are still unsatisfied. With Assembly elections fast approaching in the state, politicians have intensified their activities to woo voters in the area. However, there is a section of voters that is unfazed by the commotion, for it feels elections won’t do them any good. Some babies, quite unknowingly, are getting prepared for competitions. With “baby shows” becoming a regular fixture in the city, the innocent “harbingers of joy” are being made to battle it out for the top honours. High drama was witnessed in the Kadwai Nagar area when area residents locked a man and woman in a house. The residents alleged that man and the woman had an extramarital affair and had been using the apartment of an NRI friend as a rendezvous. Being a cold-blooded creature, fish needs special care during winters to protect it from various diseases. The immune system of the fish becomes weak and it gets more vulnerable to the attack of pathogens and serious disease outbreaks. 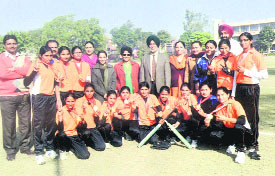 A large of number of sportspersons, accompanied by their coaches and sports organisers, took an oath of being good citizens. 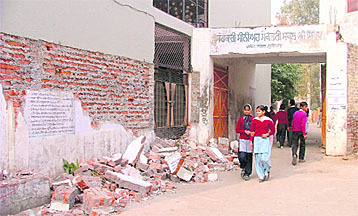 After the municipal corporation razed the office of the Block Primary Education Officer, a wall of Government Senior Secondary School, Gobind Nagar, too, was razed on a complaint lodged by a homeowner. School authorities, however, claimed the action as illegal and biased. Spending New Year with family in Nainital proved costly for a city-based doctor as thieves struck at his house in Jamalpur Urban Estate and decamped with cash and jewellery worth lakhs. The incident came to light today when the family of Dr Ashok Gupta returned from New Year vacation and reported the matter to the police. A documentary film “Socho” has been created by the Raksha Jyoti Foundation to create awareness about traffic system and on resolving various traffic problems. 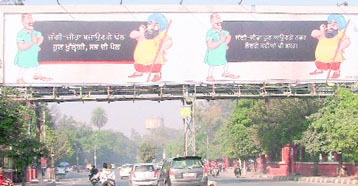 According to Ashwini Behl, president of the foundation, every resident of Ludhiana maintains traffic sense and maintains all documents before entering Chandigarh, but throws rules and regulations to the wind in his city. Four havildars of the local police station were sent to the police lines by the DSP on the directions of Khanna SSP for dereliction of duty. Tejinder Singh, DSP, while confirming the report said the four police e personnel were on duty during a cattle fair on December 30. The first meeting of the Punjabi Likhari Sabha Rampur for 2012 was held in the Canal Rest House, Rampur, today. More than 35 poets, storywriters and playwrights from the area attended the meeting. The Punjab State Committee of the MCPI (U) will contest on nine seats in the Assembly elections. This was declared by Kuldeep Singh, Secretary, Punjab State Committee of the MCPI (U) in a meeting organised at KK Kaushal Memorial Bhawan here today. Members of the Senior Citizen Forum celebrated the New Year by organising a function at the Senior Citizen Bhawan in Urban Estate, Phase II, here. Rattan Singh Dang and Kuldeep Singh Kreer, president and general secretary, respectively, welcomed the members and wished them a healthy and prosperous life in the new year. Around 50 members, who had their birthday around this time, were offered sweets and flowers. A DJ shop was destroyed in a devastating fire that broke out in mysterious circumstances in the wee hours today. A passerby noticed the fire and reported the matter to the police. It reached the spot with a fire tender and informed owner of Survey DJ Center Sarabjit Singh about the incident. But, the shop was gutted by that time. The Anti-Narcotic Cell claims to have nabbed a youth with a stolen motorcycle. The suspect identified as Raj Kumar, a resident of the Shimlapuri, was nabbed from the Gill Chowk here today. 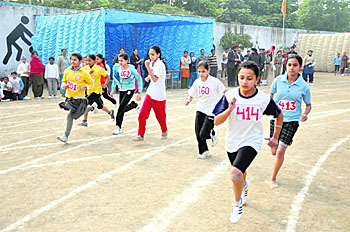 The students of Bhartiya Vidya Mandir Senior Secondary School, Kitchlu Nagar branch, dominated the proceedings, clinching 10 out of 14 titles that were decided on the first day of the BVM Inter-Branch Annual Athletics Meet that began on its Kitchlu Nagar branch campus here today.